A stunning jewellery combo by Surat Diamonds. The gold plated bangle, pendant set and necklace sets are adorned with stones, beads and meenakari work to add to their charm. They have been styled with splendid motifs, which makes them look even more beautiful. Team them up with your ethnic outfits to look gorgeous and graceful. A beautiful collection is shown here.Gold is a part of old Indian customs and religion.People just love to wear gold and silver rings without any occasion or cause. Online shopping is the best thing that can happen to you, for where else do you have the luxury to buy whatever you want from the comfort of your home. 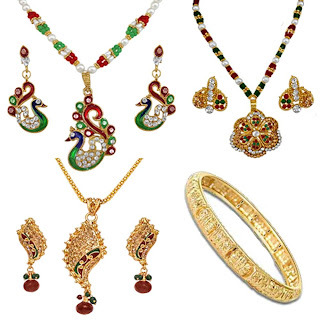 Now you can buy gold jewellery online based on factors like style, occasion, brand and price.